There’s a pretty place to eat at every corner of Anna Maria Island, from the big restaurants on the water to the cozy cottages by the sands. You can look at the whole island, from the very tip of the historic district up north down to the Bradenton Beach rentals in the south. Some of the best spots are around the northern portion of the island by Anna Maria city. Below are the five most popular places to eat on Anna Maria Island. The Sandbar Restaurant is famous for its delectable seafood dining, where you can enjoy crab, grouper, and other Florida favorites. Guests may also come across a nice bonus treat: the Sandbar is a place where you can eat with your toes literally in the sand. Few, if any, popular places to eat on Anna Maria Island can boast the same claim. Grab a grouper sandwich, crab crusted scallops, clams, and so much more over the pristine waters of Anna Maria Island. The restaurant also has some awesome wine selections, with one of the most alluring being the Lola Wine. There are also Sandbar events, such as jazz music over brunch for Sunday afternoons. There’s a lot to soak in, from the jams to the sun. It’s no wonder the Sandbar Restaurant easily stands as one of the best Anna Maria Island restaurants. This delightful Holmes Beach café boasts fruity and sugary colors on every surface. Stop here for a fanciful afternoon lunch, with a cup of coffee and a cupcake. And my, the selections you have! We adore the Coconut Dream, chocolate or yellow cupcake with coconut cream filling and buttercream icing. Other favorites include the Red Velvet, topped with cream cheese frosting, the Chocolate Chip Cookie Dough topped with mini chocolate chips, and the Twice as Nice, frosted with buttercream and covered with dark and white chocolate shavings. Cupcake Delights isn’t exactly the most traditional lunch, but when on vacation, should anything be? The location closes at 6 p.m. during the week (with a 4 p.m. closing on Sunday and Monday), so make sure you make time in the morning or afternoon. We really love the humble and quaint Blue Marlin restaurant. You are instantly greeted by a blue-covered exterior, with a very classic and Old Florida style. Inside, you will find warm wood, interesting nautical décor, and more to set the stage for a nice afternoon or lunch of authentic seafood. Fresh fish is served daily and rotates by the season. The menu includes Garlic Shrimp, Fish Rolls, Steamed Clams, Tater Soup, Pork Loin Chop, and much more. You can always close the meal out with a taste of the Honey Whiskey Flan, Tropical Bread Pudding, or the chocolate-drenched Guinness Chocolate Cake. 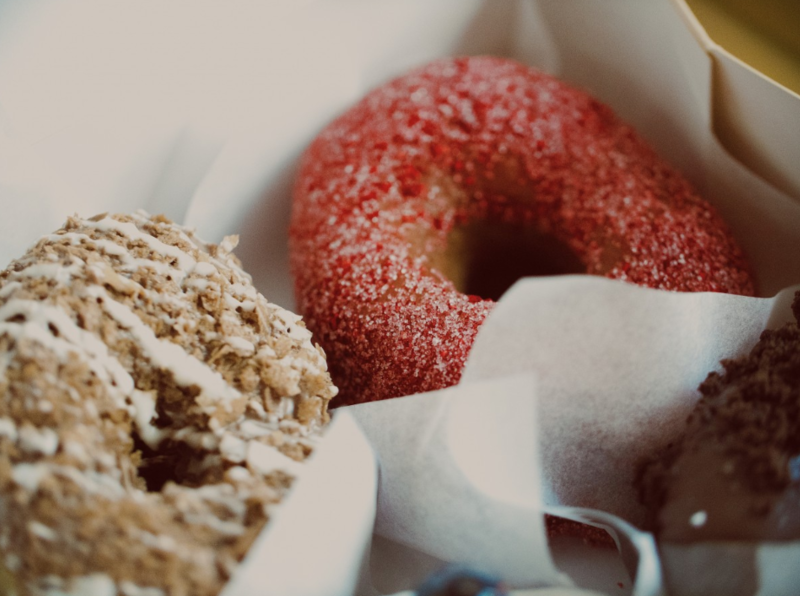 This eastern chain specializes in a wide assortment of made-to-order donuts. Guests walk in, admire the selections, and go crazy. The main option here is to build your own donut. You select the base, the icing, and the toppings. Icings include chocolate, caramel, maple, vanilla, glaze, and the “special.” This last option could be a seasonal delight, like strawberry. You then choose up to five toppings from a total selection of a 17 different toppings. You can also complement your donut with an espresso or cold brew. This location almost always has a line. Come in prepared, but excited to go a little nuts designing your very own box of donuts. Poppo’s Taqueria is the most popular place on the island for tacos. There’s really no way, to sum up, the wide selection of items here, but be sure they include hot and cold fillings, different wrap styles, and a lot of fresh ingredients. Choose a taco, bowl, quesadilla, or burrito and scan the wide ingredients list for your very own Mexican meal. Contact us for information on any of our Anna Maria Island accommodations. Stay on the north side of the island to be near any of these popular afternoon stops. Grab a donut for the day. Enjoy seafood on the sand. This is the way Anna Maria Island should be enjoyed.